The Power Breath Meditation Workshop provides breath-based tools that decrease the stress, anxiety and sleep problems that many veterans experience. Course participants notice an improvement in relationships and an enhanced sense of mental clarity and well-being. 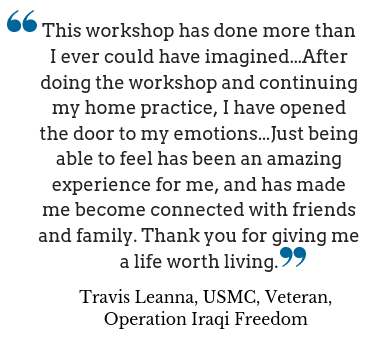 The PWHT Five-Day Power Breath Meditation Workshop is offered complimentary to veterans, active duty military members, and their immediate family. To register please send an email to the contact of your city. Please provide your name, city, and state, phone number and your current military status (veteran or active duty). If there is no workshop presently listed in one of the cities where we teach – please reach out to the contact for that city and have them add you to the waiting list for the next workshop in your area. Please provide your name, city, and state, phone number and your current military status (veteran or active duty). For general inquiries about workshops, please contact info@pwht.org. Our friends at the Veterans Crisis Line are available 24x7. A look inside the Power Breath Meditation Workshop - Veterans share their experience. © 2014 Project Welcome Home Troops, a project of the International Association for Human Values. All Rights Reserved.